Human remains may be embedded in the mud of the North Atlantic where the New York-bound Titanic came to rest when it sank 100 years ago, a federal official said Saturday. A 2004 photograph, released to the public for the first time this week in an uncropped version to coincide with the disaster’s centenary, shows a coat and boots in the mud at the legendary shipwreck site. “These are not shoes that fell out neatly from somebody’s bag right next to each other,” James Delgado, the director of maritime heritage at the National Oceanic and Atmosphere Administration, told The Associated Press in a phone interview. 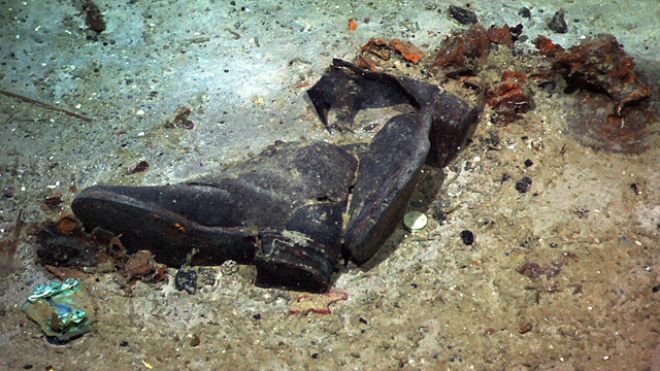 via Officials say human remains may be at Titanic shipwreck site | Fox News.